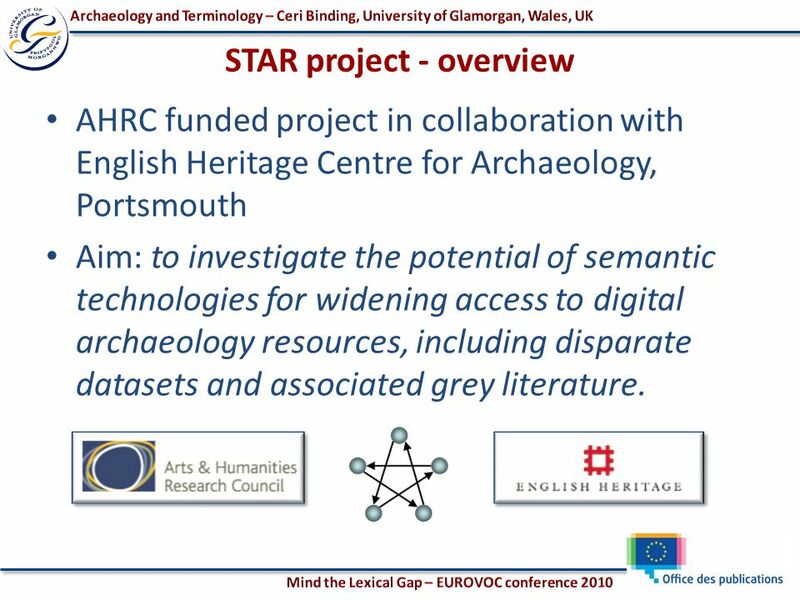 3 STAR project - overview AHRC funded project in collaboration with English Heritage Centre for Archaeology, Portsmouth Aim: to investigate the potential of semantic technologies for widening access to digital archaeology resources, including disparate datasets and associated grey literature. 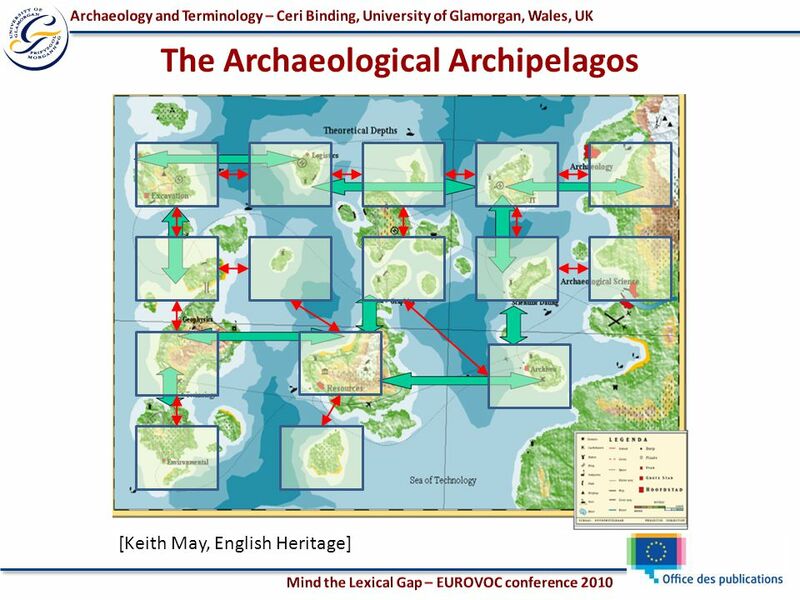 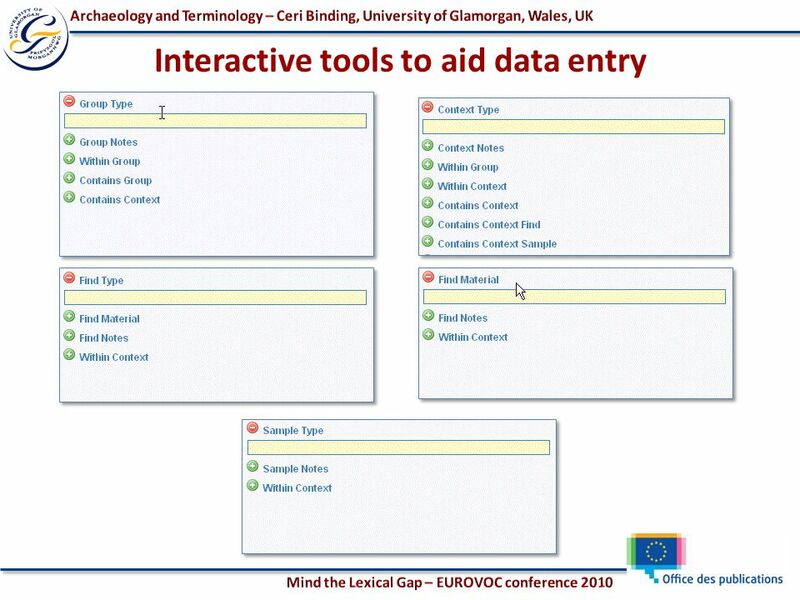 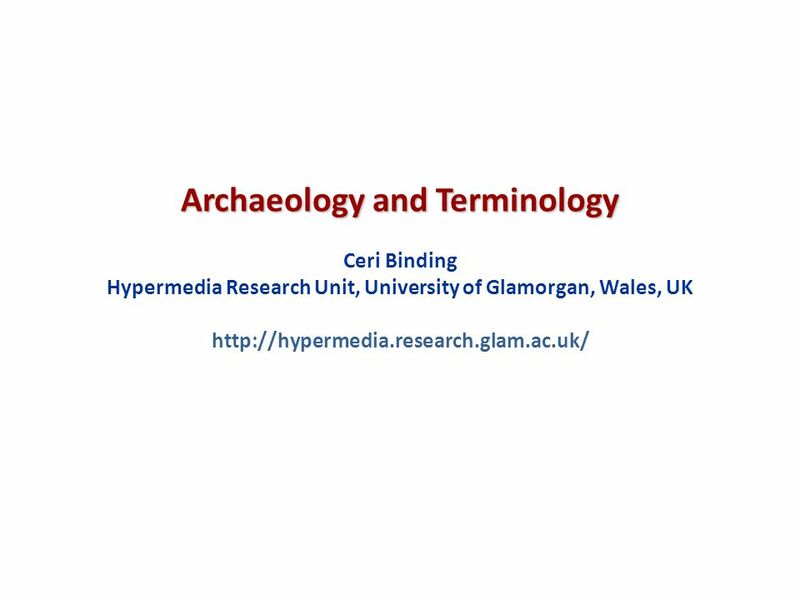 Download ppt "Archaeology and Terminology Ceri Binding Hypermedia Research Unit, University of Glamorgan, Wales, UK"
Long-term Digital Metadata Curation Arif Shaon University of Reading 16 April 2014. 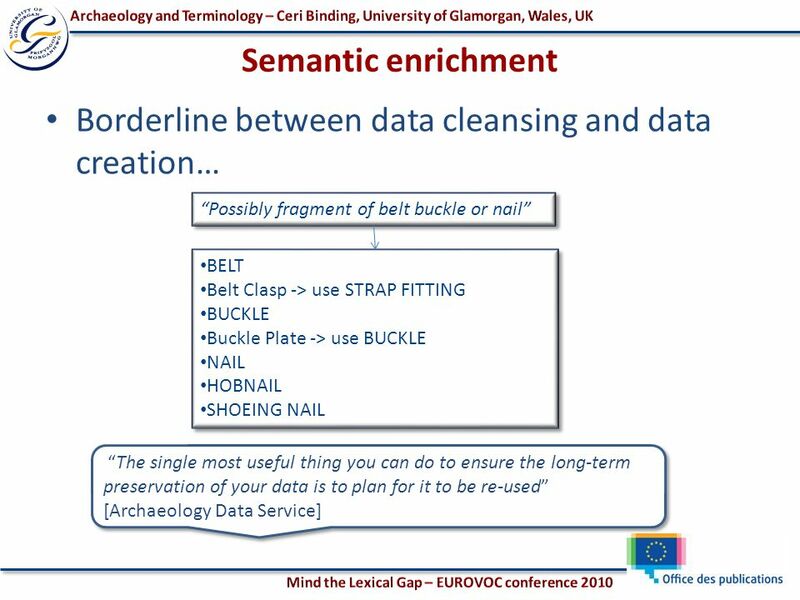 TU/e technische universiteit eindhoven Hera: Development of Semantic Web Information Systems Geert-Jan Houben Peter Barna Flavius Frasincar Richard Vdovjak. 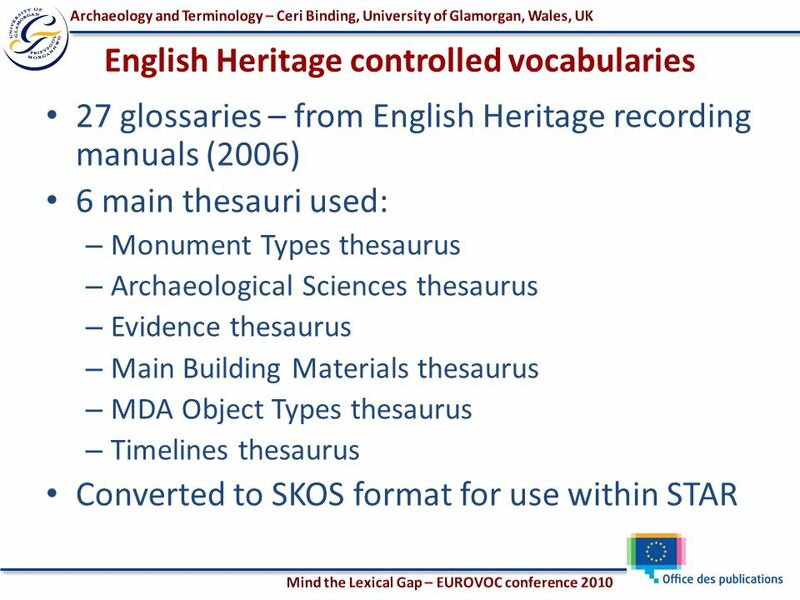 What is a thesaurus and why should I use one? 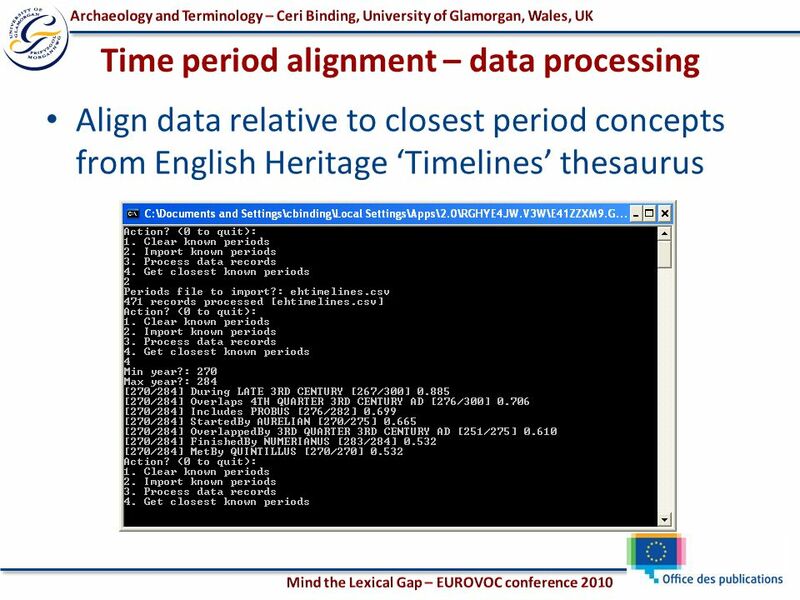 Data Standards Unit English Heritage. 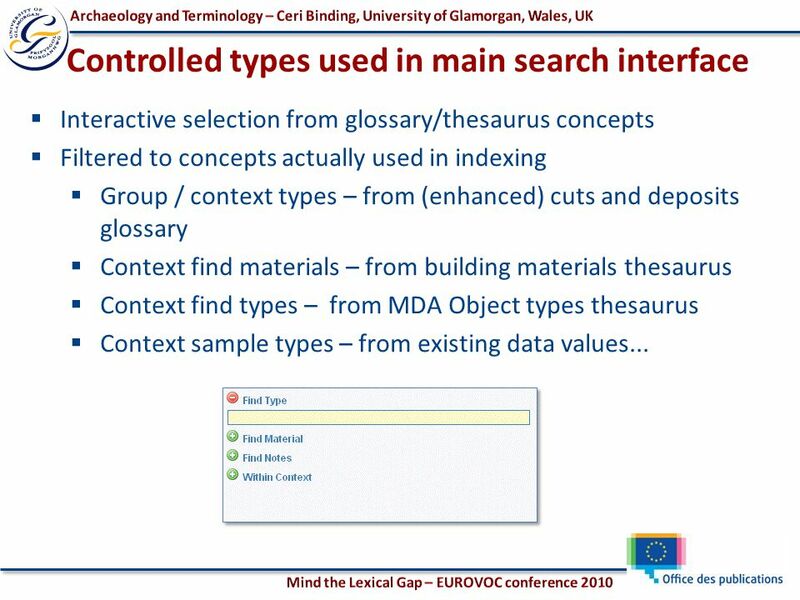 Interoperability Aspects in Europeana Antoine Isaac Workshop on Research Metadata in Context 7./8. 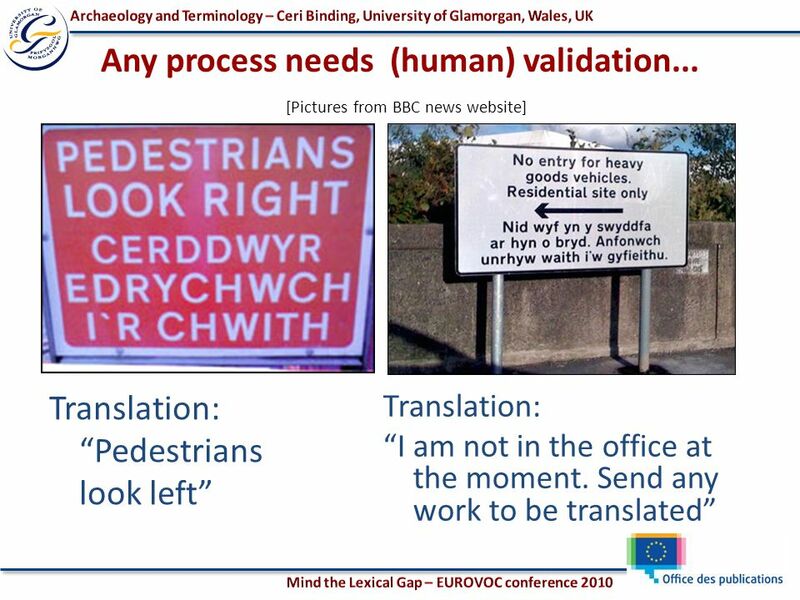 September 2010, Nijmegen. 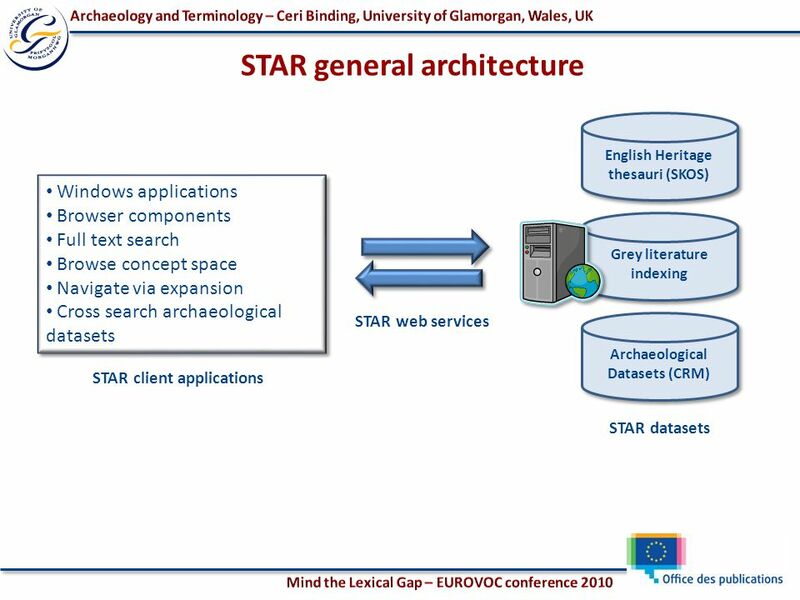 STELLAR Introduction Ceri Binding, Douglas Tudhope Hypermedia Research Unit, University of Glamorgan. 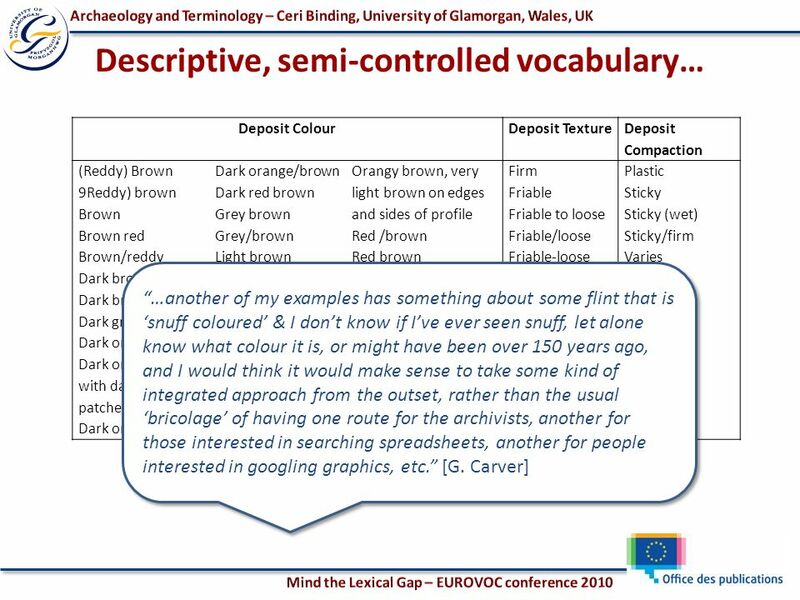 Associative and Spatial Relationships in Thesaurus-based Retrieval Harith Alani 1, Christopher Jones 2, Douglas Tudhope 1 1 School of Computing, University. 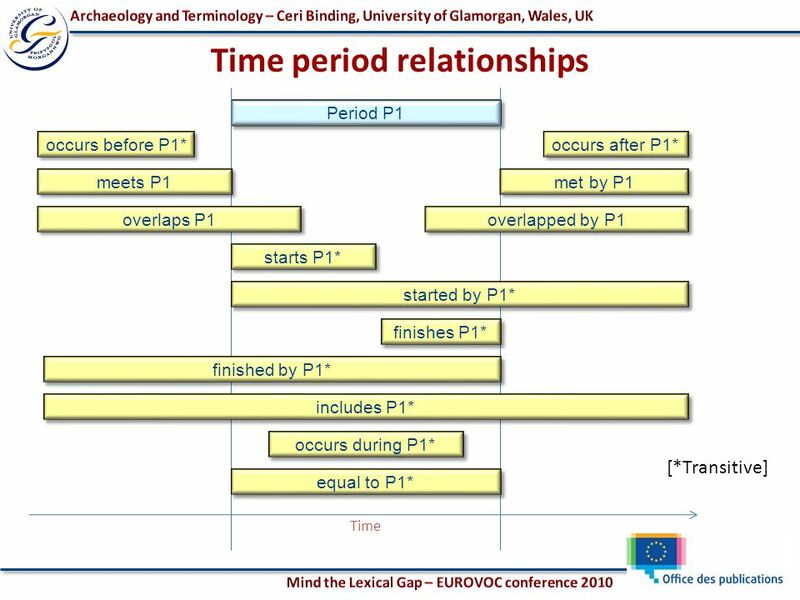 ICS-FORTH Which Period Is It? 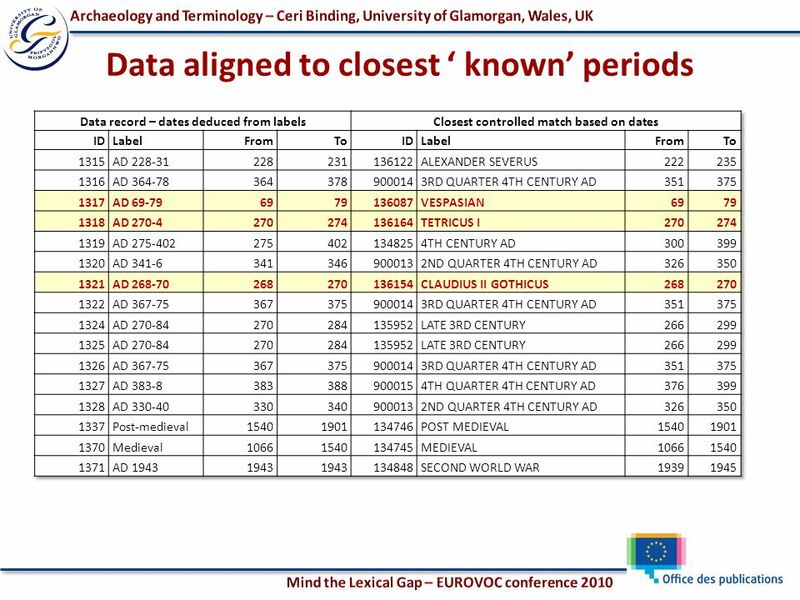 A Methodology To Create Thesauri Of Historical Periods Martin Doerr, Athina Kritsotaki, Stephen Stead. 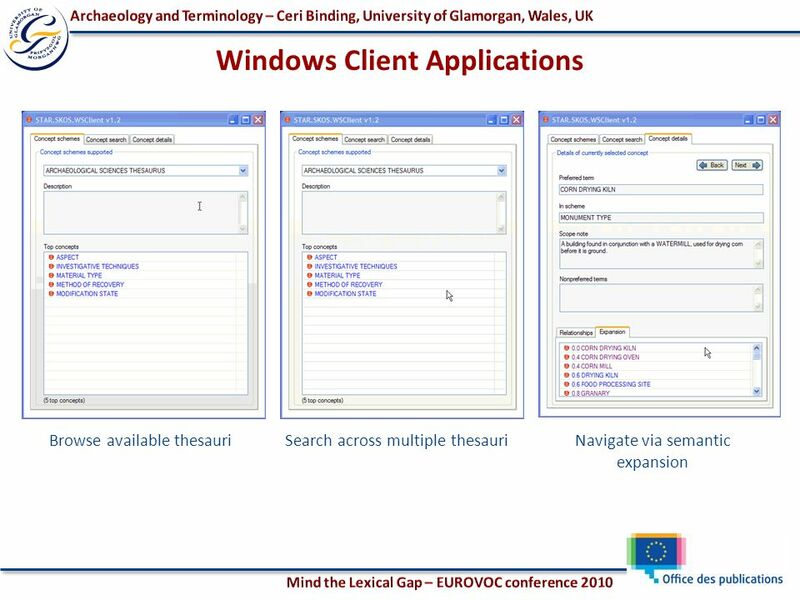 WWW Challenges : Supporting Users in Search and Navigation Natasa Milic-Frayling Microsoft Research, Cambridge UK SOFSEM 2004 January 28, 2004. 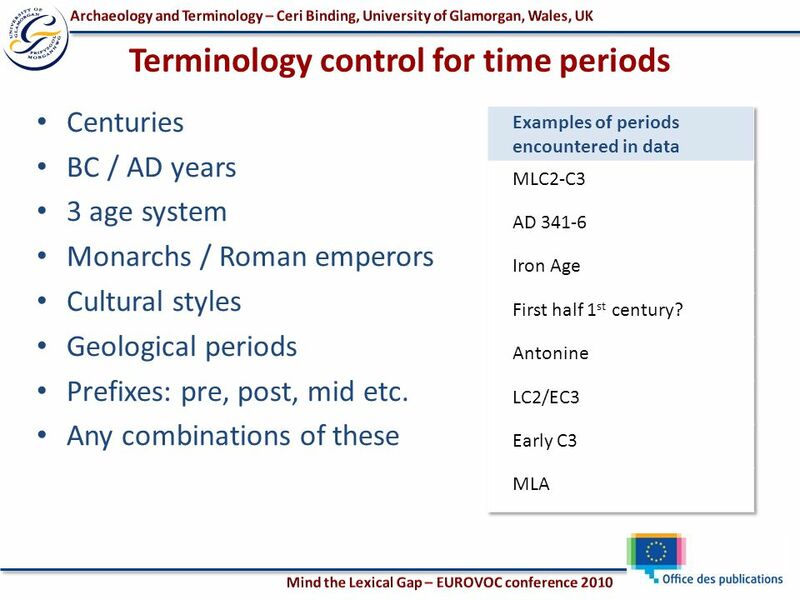 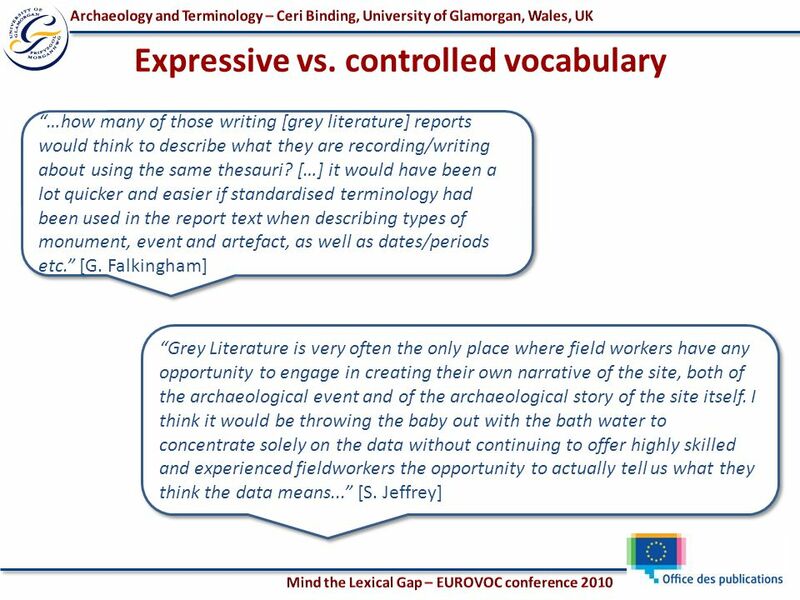 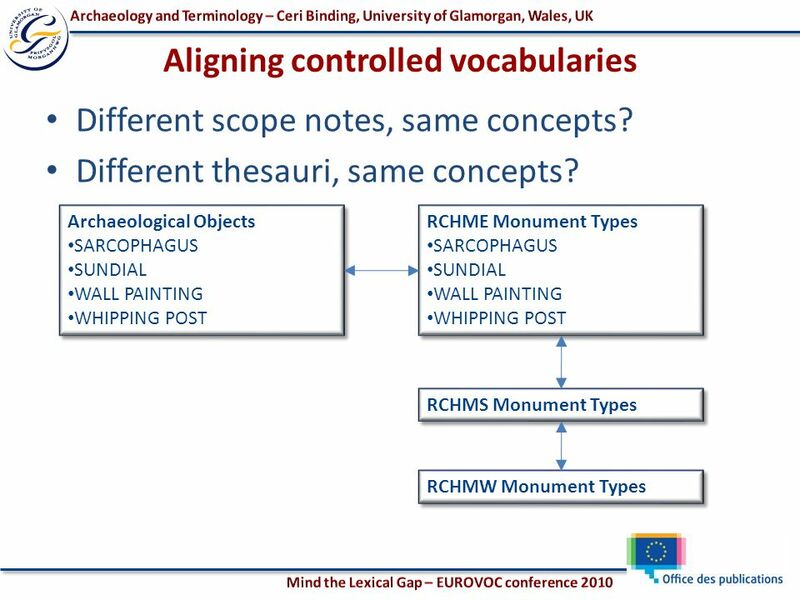 Semantic Annotations in the Archaeological Domain Andreas Vlachidis, Ceri Binding, Keith May, Douglas TudhopeSTAR STAR Semantic Technologies for Archaeological. 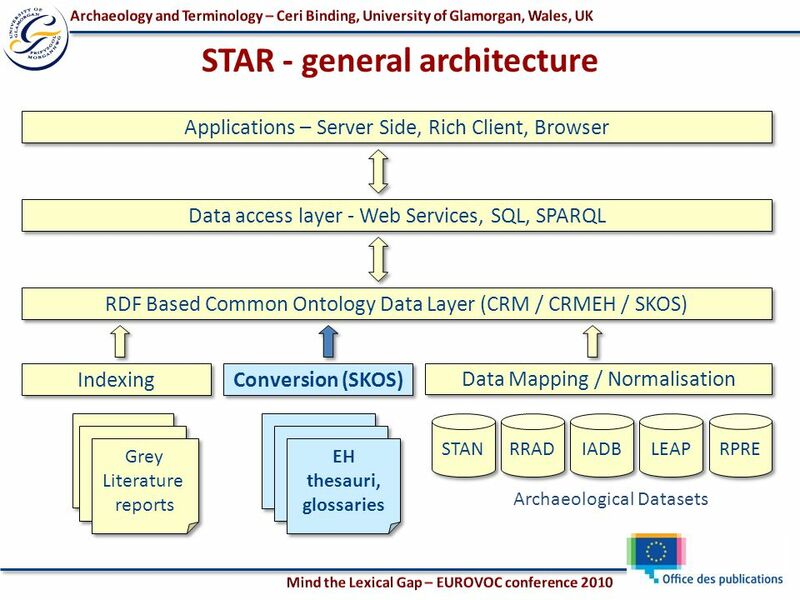 STELLAR Introduction Douglas Tudhope Hypermedia Research Unit, University of Glamorgan. 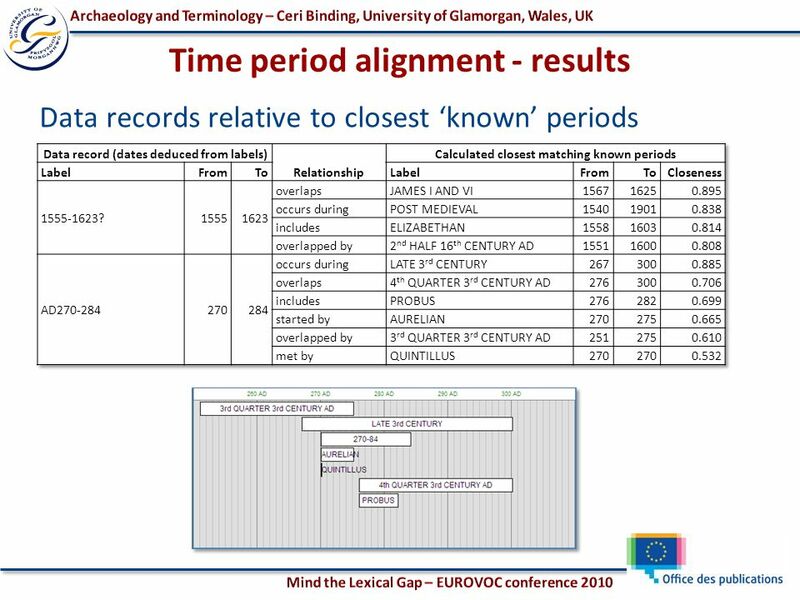 Learning and Teaching with the UK Census Developing the Collection of Historical and Contemporary Census Data and Materials into a Major Learning and Teaching. 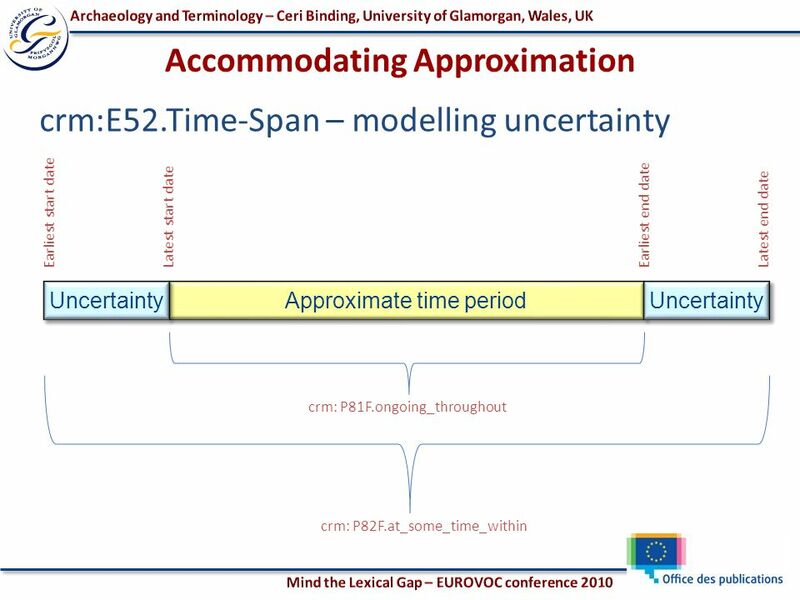 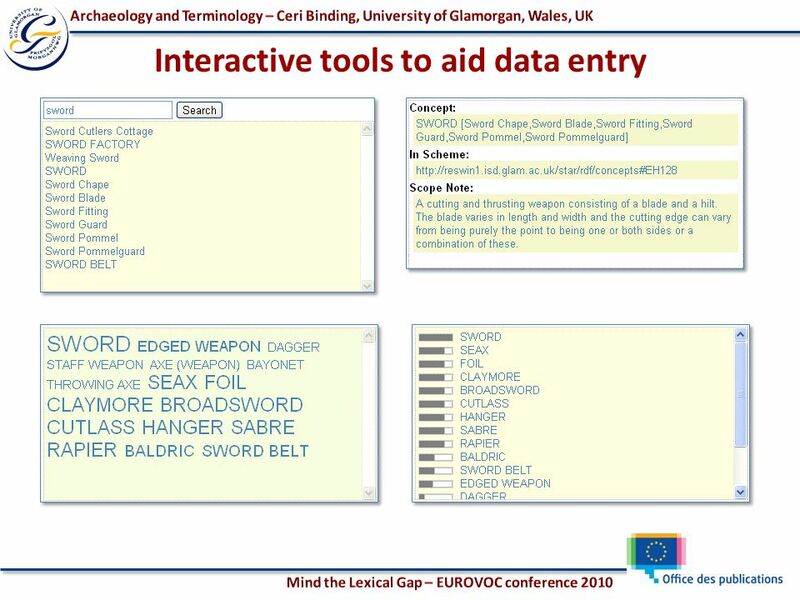 SKOS and Other W3C Vocabulary Related Activities Gail Hodge Information International Assoc. 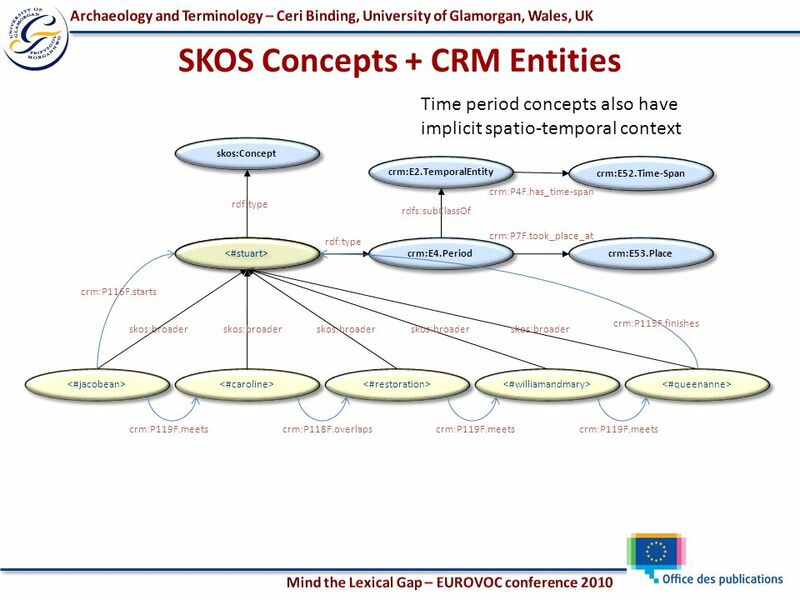 NKOS Workshop Denver, CO June 10, 2005.